A woman's role is ever changing. She can be a mother, a wife, or a single career woman who is lost and is search for her place in the world. 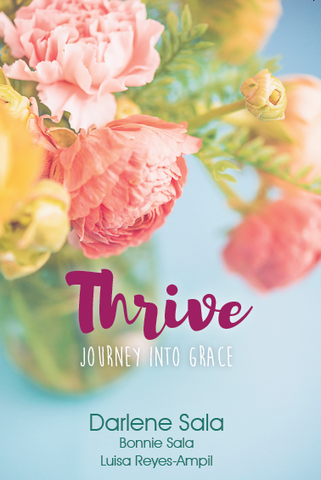 One thing is for sure, she will be facing challenges and temptations that tests her will and faith in herself and the Lord.In response to these, OMF Literature, Inc., the foremost publisher of inspirational books, presents Thrive: Journey Into Grace, a new devotional for women. Authors Darlene Sala, Luisa Ampil and Bonnie Sala, draw inspiration from their own experiences and life journeys to present messages in Thrive that speak directly to women and their daily struggles in living a purposeful and graceful life. Each entry contains a personal anecdote and teachings based on the Bible. • Darlene Sala is well-known as a pastor’s wife, counsellor, missionary, Bible teacher and co-founder of Guidelines International Ministry. She is also the author of four bestselling books dedicated to guiding women in their everyday lives: Encouraging Words for Women, Inspiring Words for Women, More Precious than Diamonds and Refreshing Words for Busy Women. • Luisa Ampil has served with Guidelines International Ministry since 1998 and is now the ministry’s director for the media and its Philippine ministry. She is also the producer, writer and voice behind “Mula sa Puso,” a Tagalog radio program on DZAS 702. THRIVE: Journey into Grace is available at National Bookstore, OMF Lit Bookshop, Passages, and other leading bookstores nationwide for P350. The book can also be ordered online through passagesbooks.com.